So we are neck-deep in a Doctor Who sort of weekend over here. Isn't everyone? 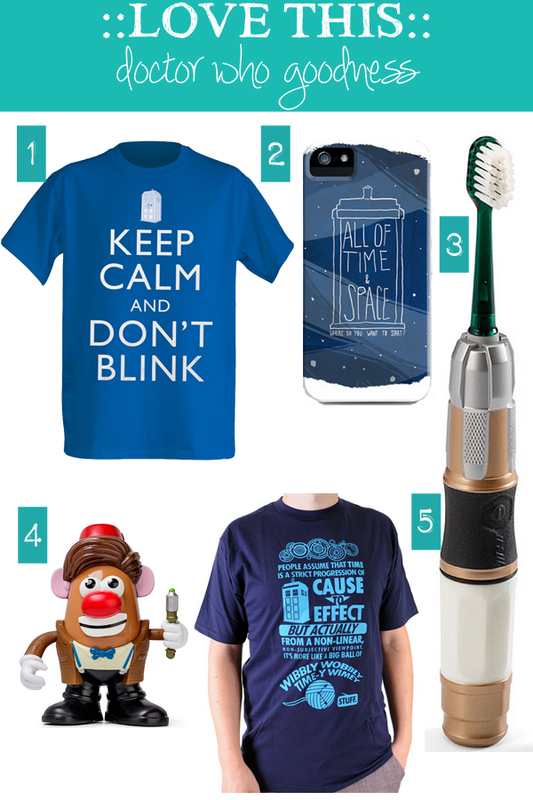 So I thought I'd pull together some of my favorite Doctor Who goodies I've come across lately (and have been adding to potential gifts for Jon for Christmas). And if you have no idea what I'm talking about, no worries. I'll be back to non-time travel related programming in a day or so. 3. A "Sonic Screwdriver" toothbrush. But of course this exists. 5. And he's my doctor because he says things like this: "People assume that time is a strict progression of cause to effect, but actually from a non-linear, non-subjective viewpoint, it’s more like a big ball of wibbly-wobbly, timey-wimey… stuff." And you can wear that on a t-shirt, which is pretty much perfection. Hope your weekend is full of good things and time to just have a little fun.